It is a real pleasure for me to attend this dinner to welcome Mr. Feng Xiaogang and his colleagues. I am delighted that the Chinese Embassy and the British Film Institute have come together to co-host this event. I want to thank the BFI Chairman, Mr. Greg Dyke, for his great support. Mr. Feng is a well-known film director in China. Recently, he is responsible for two new catchphrases in China. The first one is ‘tailor made’. This originates from his New Year season film titled Personal Tailor. The film was a tremendous blockbuster hitting a record high of more than 700 million yuan at the box office. I can proudly say that the dinner tonight is also ‘tailor made’ for Mr. Feng. The second catchphrase is a ‘Feng style gala show’. This refers to the 2014 CCTV Chinese New Year Gala. This gala has the largest audience for any entertainment show in the world. The latest 2014 edition of the Gala was directed by Mr. Feng. His skills created a masterful concoction of the classic and the modern. It drew an estimated 800 million viewers to the broadcast. Mr. Feng is visiting the UK for ‘Spectacular China’. This is a special event featuring his films. Over the recent week, a number of films by Mr. Feng have been screened across London. I have been told that these films have captivated British audiences and hugely entertained them. Britain is famous worldwide for its very funny film entertainment. A typical example is ‘Mr Bean’. Though Feng-style humor is something new for Britons I am glad to learn that his popularity among British viewers and in British market is unquestionable. Mr. Feng, I congratulate you on your success. China and Britain both have proud and distinguished cultures, of which film is a vital part. Britain leads the world in ideas, playwriting and production. Chinese cinema in recent years has grown at a stunning rate. China is now the world’s third largest film-maker and the second largest film market. 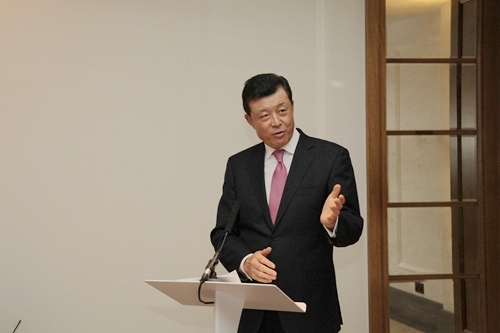 I strongly believe that deepening China-UK exchanges and cooperation in cinema will not only enhance understanding and friendship between our people, but also promote the growth of our film industries. 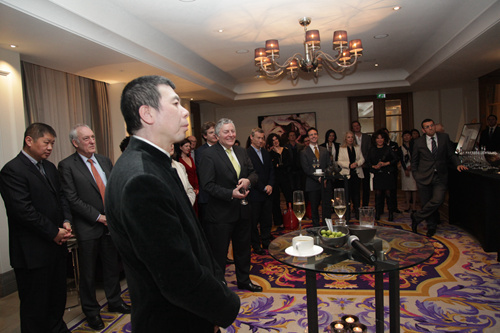 I have no doubt that 2014 will be a landmark in the history of China-UK film cooperation. The screening of Mr. Feng’s films has kicked off a good start. Moreover, China and the UK are discussing an agreement on film co-production. I have also learned that in June the BFI will launch a ‘China and UK Film Celebration’ programme across the UK. The highlight of this programme is a four-month China film season called ‘A Century of Chinese Cinema’. This will showcase more than 80 films of different periods since the first Chinese movie was made. This will be the largest programme of its kind between China and the UK. I do hope that Chinese and British film-makers will seize the opportunities brought by a growing China-UK relationship and make the film industry a new highlight of our cultural exchange. I am sure this will not only promote long-term development of our film industries but also delight hundreds of millions of moviegoers in China and in Britain.